Peggy Ann Mc McCormack was born June 20, 1936 in Henly, Texas. It was within the Great Depression years and the family left Texas t move to the hills of Arkansas where land was cheap and farmland with a house could supply a garden and warmth for the family. Peggy was 9 years old. She had 2 brothers and 2 sisters. Her parents were Charles William and Isabell Rose McCormack. The small farm they chose was just outside of Elkins, Arkansas, located about 2 miles from the school bus route and the mail route. Peggy grew up as an active tomboyish girl. Her schoolmates at Elkins Schools considered her friendly and happy. She was a better than average student. For a short while the family moved to New Mexico. During that time she corresponded with an Elkins classmate before returning to Arkansas. In 1952 at the age of 16 Peggy developed bulbar poliomyelitis, a condition that often produced permanent paralysis from the neck downward.This was the height of the poliomyelitis epidemic and at that time there were no vaccines or any known cure for the disease. Peggy was admitted to Fayetteville City Hospital cyanotic and in a coma. Dr. Joe B. 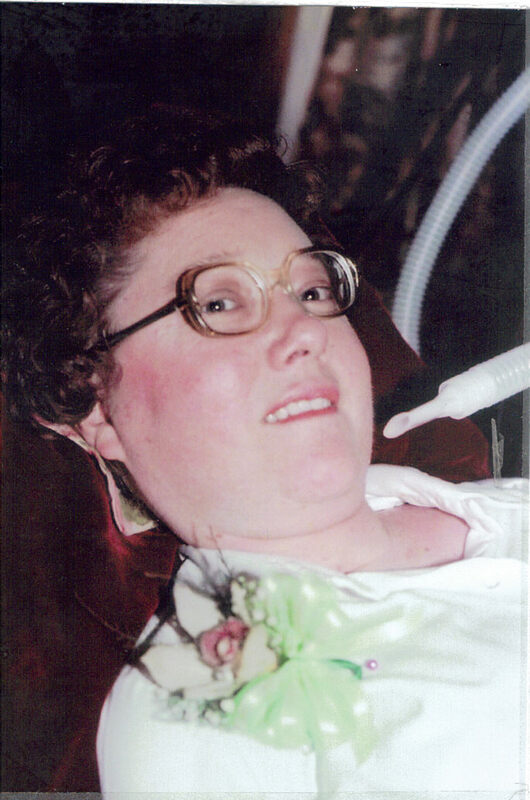 Hall immediately placed her in an artificial respirator– an iron lung, a metal tube long enough to accommodate persons lying on their backs with heads extended outside. The tube was air tight with an electricity-powered bellows, which created positive and negative pressure within the iron lung to produce respiration. A mirror was attached to the frame to allow visual contact with visitors. Peggy lived in the iron lung thereafter except for a span of perhaps 2 hours each day. Outside of the iron lung she used an airtight chest respirator or rocking bed. Dr. Hall continued to see her and remained her physician and life long friend. After Peggy was stabilized she was sent to hospitals or rehabilitation institutions in Fort Smith and Little Rock, Arkansas; Houston, Texas; Omaha, Nebraska and Hot Springs Georgia.It was in Omaha at the age of 18 that the nursing staff showed her how to hold in her teeth a paintbrush attached to a long stick. She then maneuvered it with her tongue to draw or paint, a skill she further developed throughout her life. Her proficiency and artistic skill eventually led to earning a living with her paintings. These included small animal pictures on wood, landscapes and portraits. Following the rehabilitation of about two years the family moved into a small rent house at 1144 Duncan Avenue in Fayetteville, Arkansas. She lived there the remainder of her life. Her mother, affectionately known as “Maw-Mac” was her primary caregiver even during her hospitalizations for frequent episodes of respiratory distress. Despite her immobility Peggy became active in her community and church. A special Fire Department team was on call during electrical failures to provide a back-up generator to maintain her respiration. “Maw Mac” would use a hand crank on the iron lung to continue airflow until the firemen arrived. The fireman also helped take her to church using the portable respirator. As electric typewriters came on the market, Peggy used the same stick-technique to tap keys to write poetry and children stories. She joined the Springdale Poetry and Writers group and became the telephone caller for meetings, again using her stick-technique to tap phone numbers. Her book of poetry, My Spirit is Free—Reflections From an Iron Lungwas published and copyrighted in 1981. Peggy lived a productive, happy and successful life in spite of her confinement and immobility. She was admired and loved for her bright outlook and encouraging nature. Visitors easily ceased to see the respirator. They saw only Peggy. Her life that could have been dreary and despairing was centered instead on others. Faith in her God gave her an inner peace and acceptance of her physical limitations. Her radiant smile and genuine interest in people and life gave her many visitors a strong feeling that life could be good no matter the circumstance. The story of this amazing woman of courage and compassion continues to influence others today. Peggy McCormack died on May 21, 1983 one month before her 47th birthday.